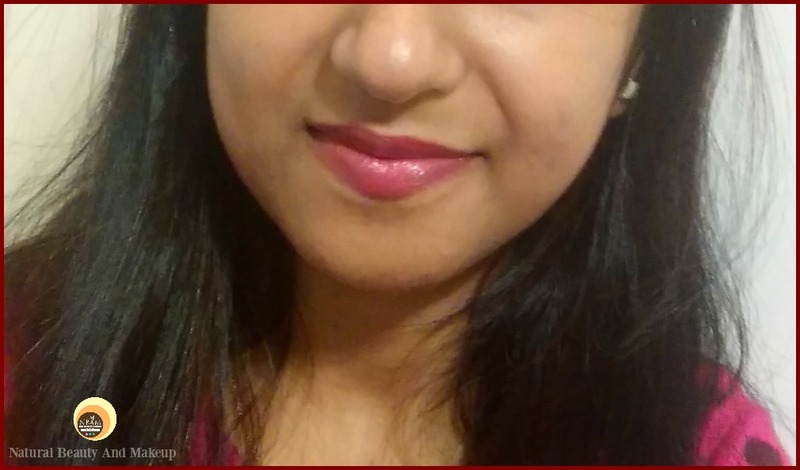 Achieve pout perfection with the easy to glide Lakme 9-5 and say goodbye to touch-ups. Red Alert lip liner comes in a rose-gold wooden pencil form which needs sharpening to get the perfect definition each time. The tip is further protected by a sturdy transparent plastic cap and the end is colour coded for easy shade detection. The packaging is practical, hygienic and travel-friendly. Lakme 9-5 Lip Liner Red Alert is a stunning cool-toned red shade with a creamy texture and satiny matte finish formula. 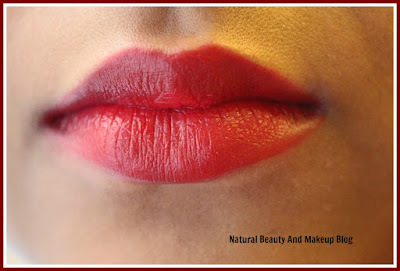 Supremely pigmented that makes for a perfect base for the red lipsticks. It has a slight artificial fragrance but not bothersome. 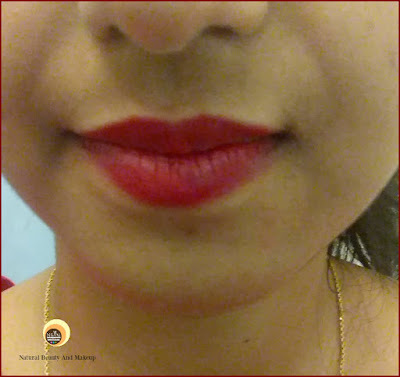 As instructed, I line my lips starting in the centre of the upper lip to the outer edges of the lips, following the contour of my mouth and line my bottom lip following the same method as well. 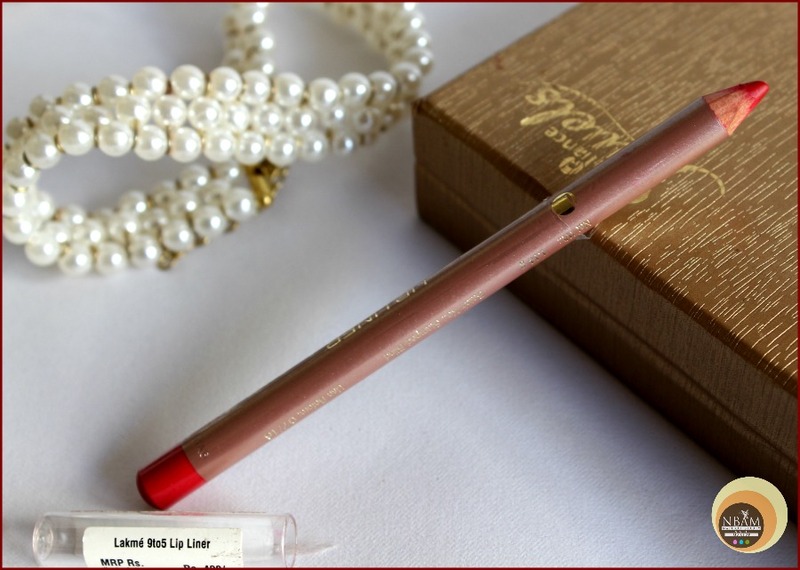 I fill in my lips with the lip pencil either to create a base for the lipstick or just wear it alone as a lip colour. My lips are super dry so I hydrate my lips with a lip balm before applying the lip liner and voila! I am done 😊. 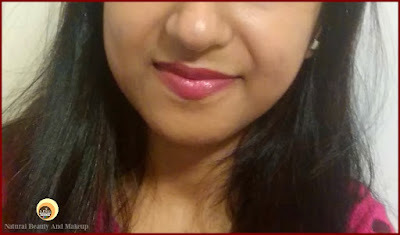 I am super impressed with its performance and I have many reasons for that, believe me!The texture of this liner is creamy thus glides on the lips effortlessly and helps prevent lipsticks from bleeding.Though it provides a satiny matte finish to my lips, sometimes it settles into fine lines hence lips exfoliation is a must prior to the application. 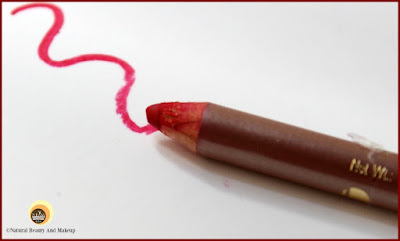 The colour pay off is excellent, one layer of this liner and it covers my pigmented lips amazingly. Moreover, it enhances the staying power & the beauty of my Colorbar SweetHeart 023M Matte Touch red lipstick which I find truly awesome 😊. 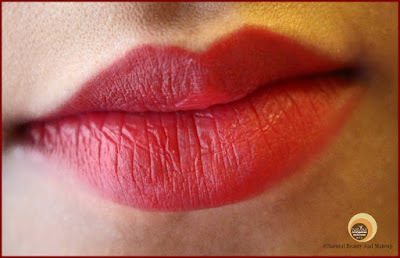 When worn on its own, it lasts for about 5-6 hours and doesn’t feel heavy or tacky on the lips. 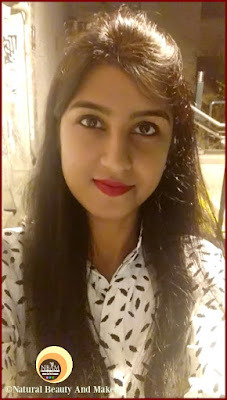 I went for shopping applying this liner by 3 pm and had evening snacks in between, the colour stayed intact! Even after having super oily food in the dinner, when I reached home by 10, noticed it left a beautiful red stain on my lips. I use my Bioderma miceller water or Vaseline to remove it from my lips. A faint stain of Red Alert!! 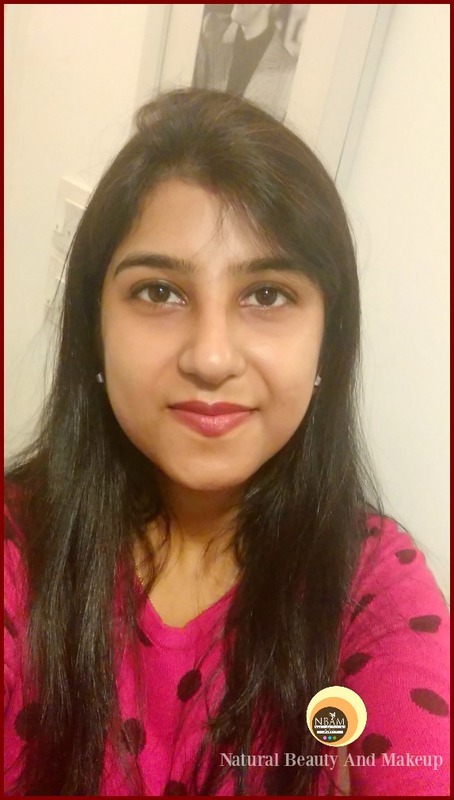 The other day, I applied my Maybelline Tinted Lip balm, Tropical Punch (reddish pink shade) on the top of this Red Alert lipliner. And the final output was this …. With Tropical Punch Lip Balm on top! Some may find it pricey (Rs.400 for 1.14g)! It needs sharpening which is hygienic but leads to the wastage of product too! As this is a small product, it may not last long if used and sharpened daily but it’s not a con for me at all! 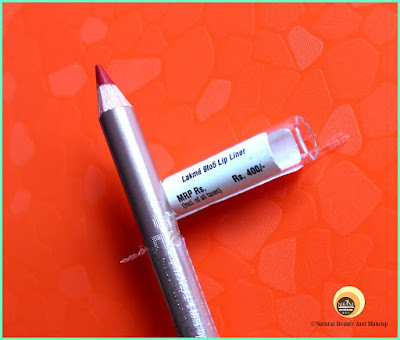 Overall, Lakme Red Alert lip liner is a gorgeous red shade with a creamy formula and matte finish that can be worn on its own or layered with lipsticks and lip glosses. This is an everyday-wear shade with a long-lasting formula and is water-resistant too. I am in love with this product and interested to try out its siblings (the other shades) from the 9-5 range as well! If you are looking for an affordable red lip liner with the good quality and great pigmentation then this product is worth a try! 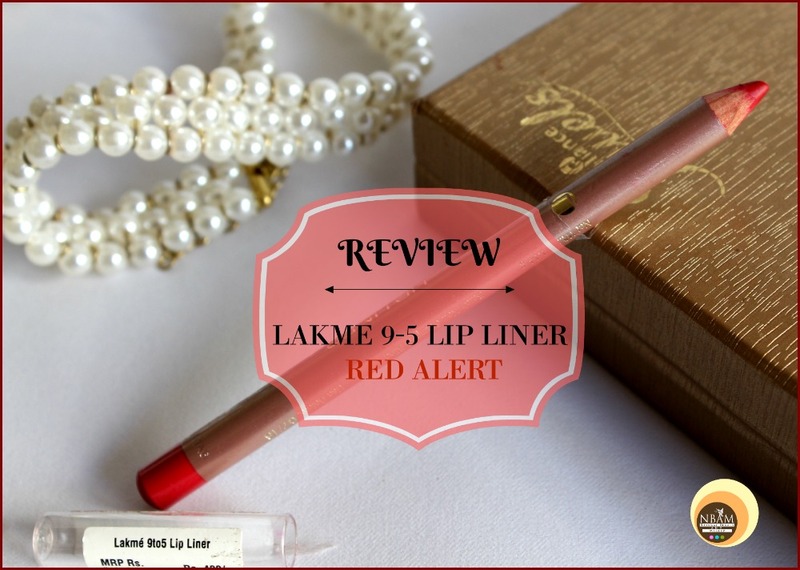 Have You Ever Tried Lakme 9-5 Lip Liner Red Alert? If Yes, Please Share Your Experience With Me In The Comment Section Below. The shade looks so gorgeous and you look pretty with that red lipstick. That is a stunning red shade! Will give this one a go! It does have good pigmentation and the shade is pretty! Not easy to come by though in Malaysia. Not many outlets carry Lakme brand, but I did manage to grab their lippies, thank god, when I was at another mall. I love this red shade. Gorgeous, got to agree on dapping some balm over it.